Responding to stress and tension in the body, by increasing blood and nerve supply to the muscles and stimulating the parasympathetic nervous system. Greatly improving the function of the blood and circulatory system, by aiding the transport of nutrients, oxygen, enzymes, and hormones more readily and efficiently throughout the body. Improving the elimination of organ and colon waste/toxins for the body. Stimulating the body’s lymphatic system supporting flow and also detox. Reducing pain and inflammation in the body has a large effect on mood and well being. Reflexology combined with Colon Therapy and Nutritional Counseling has the power to address over all health, including digestive and colon issues from constipation, diarrhea, gas, toxic colon, allergies and all colon disease, including IBS. Suzanne combines these treatments to suit your individual needs to restore your body to a natural balance and good health. Reflexology can also be a helpful treatment for many stress/anxiety disorders and chronic health conditions such as back pain, poor circulation, high blood pressure, hormonal imbalances, pregnancy, insomnia and sleep disorders. Reflexology is a non-invasive complementary therapy that does not aim to diagnose or cure illness but rather to promote the body’s powerful self-healing capability and improve and optimize physical, emotional and spiritual well being.Reflexology should not replace medical treatment. 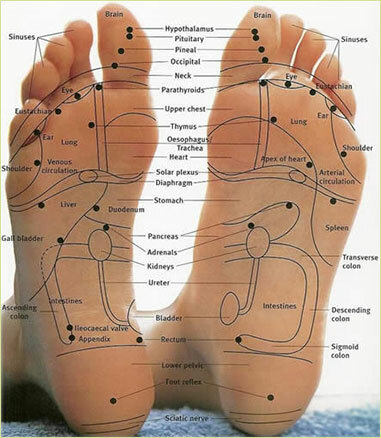 Reflexology combined with Colon Therapy is a powerful combination to put you on track to better health. Many Doctors and Naturopaths believe that most major illnesses begin with the Stress Response. Contact Suzanne to schedule your reflexology treatment. I have had phenomenal changes in the way my body feels. I’m so much more energetic and lighter feeling. I have been making more health concious decisiions in every aspect of my life. I honestly have never been happier. Few of us realize that failure to effectively eliminate waste products from the body causes so much fermentation and putrefaction in the large intestine, or colon, that the neglected accumulation of such waste can, and frequently does, result in a lingering demise! … Your process is amazing. I have to admit that at times I doubted whether it would work but finally one day it just naturally started happening … and I don’t just mean the weight loss, but I mean happiness, contentness and overall good self well-being … I feel like a much happier and calm person. As a Health Counselor & Digestive/Colon Therapist, I am your personal advocate for living an energized and passionate life. Guard well, your spare moments. They are like uncut diamonds. Discard them, and their value will never be known. Improve them and they will become the brightest gems in a useful life. Budgeting time for body work at consistent intervals is truly an investment in your health. Consider massage appointments a necessary piece of your health and wellness plan.